Proudly handing the reverend an envelope, Jack replied, "Using my sales prowess, I was able to sell 20 bibles, and here's the $200 I collected on behalf of the church." "Fine job, Jack!" The minister said, vigorously shaking his hand. "You are indeed a fine salesman and the Church is indebted to you." Turning to Paul, "And Paul, how many bibles did you sell for the church last week?" Paul, smiling and sticking out his chest, confidentl replied "I am a professional salesman. I sold 28 bibles on behalf of the church, and here's $280 I collected." The minister responded, "That's absolutely splendid, Paul. You are truly a professional salesman and the church is also indebted to you." Louie silently offered the minister a large envelope. The minister opened it and counted the contents. "What is this?" the minister exclaimed. "Louie, there's $3200 in here! 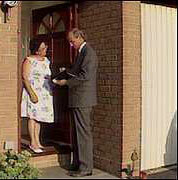 Are you suggesting that you sold 320 bibles for the church, door to door, in just one week?" Louie just nodded. "That's impossible!" both Jack and Paul said in unison. "We are professional salesmen, yet you claim to have sold 10 times as many bibles as we could. ""Yes, this does seem unlikely," the minister agreed. "I think you'd better explain how you managed to accomplish this,Louie." Louie shrugged . "I-I-I re-re-really do-do-don't kn-kn-know f-f-f-for sh-sh-sh-sure," he stammered. Impatiently, Peter interrupted. "For crying out loud, Louie, just tell us what you said to them when they answered the door!" "A-a-a-all I-I-I s-s-said wa-wa-was," Louis replied , "W-w-w-w-would y-y-y-you l-l-l-l-l-like t-t-to b-b-b-buy th-th-th-this b-b-b-b-bible f-f-for t-t-ten b-b-b-bucks---o-o-o-or---wo-wo-would yo-you j-j-j-just l-like m-m-me t-t-to st-st-stand h-h-here and r-r-r-r-r-read it t-to y-y-you??"